The health benefits of coconut oil are many, and there are many various coconut oil uses. According to Mary G. Enig, PhD, in her presentation at the the AVOC Lauric Oils Symposium, coconut oil is a beneficial oil for the prevention of heart disease. Also, it provides a source of antimicrobial lipids for those with compromised immune systems. Coconut oil seems to be a food that may also have anticancer benefits. More research must be done on this topic, but coconut oil does have antimicrobial properties, which make coconut oil capable of destroying or inhibiting the growth of harmful microorganisms. One of the many nice things about coconut oil being a saturated fat is that it will neither break down into free radicals nor will it lose its many nutritious properties when used at high heats. This makes coconut oil excellent for frying, baking, cooking etc. Coconut oil is a solid at room temperature. It can be used the same way that you would use any other type of cooking oil: Cooking, frying and baking. Coconut oil is exceptional in curries. You can add it to pasta sauces, frying eggs, toss in your pasta or dip your bread in it. If you like the taste, you can gently melt the coconut oil and drizzle it over fruits, add it to hot drinks like lattes, hot chocolate, coffee or tea. 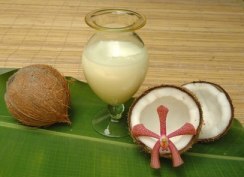 Coconut oil is an excellent addition to kefir smoothies. While some people enjoy the taste of coconut oil and happily use it in daily in their cooking, baking, frying, smoothies, hot drinks, etc., others gag at the mere smell of it. If you are one of those people who want to add coconut oil to your diet but cannot deal with the smell or taste, here's an idea. Measure the coconut oil into 1 tablespoon amounts. Then, when you want to use your coconut oil, simply take out the tablespoon of frozen oil and break it into smaller pieces so that you can swallow them. The oil will start to melt in you mouth. Follow that with a healthy and tasty drink of your choice. Using this frozen method, you will be able to swallow your coconut oil like you would a pill. Freezing will not effect the nutrients in this wonderful oil. Excellent oil in making baby food. Use it as a hair tonic. Some have said that it reduces gray hair. Apply it to bee stings and bug bites to reduce itching. Fantastic as a natural vaginal lubricant. Use it as a skin moisturizer. Try it as a natural underarm deodorant. Convinced of all of the goodness of coconut oil? Start enjoying all of the health benefits of coconut oil today. Follow the link to get coconut oil at a very competitive price.